The SafeSearch Incognito is a Google Chrome extension which introduces some changes to settings of web-browsers by replacing the home page, newtab and search engine by default. It can bring a security risk to your computer. Of course, the SafeSearch Incognito is just a browser extension, but this plugin can redirect your Chrome browser onto unwanted sites, even without your permission and desire to see it. You need to follow the tutorial below which will allow you to delete SafeSearch Incognito add-on and clean your web browser from other unwanted plugins using the standard features of Windows and some proven freeware. When you are performing searches using the web browser that has been affected with SafeSearch Incognito, the search results will be returned from Bing, Yahoo or Google Custom Search. The creators of SafeSearch Incognito add-on are most likely doing this to generate advertisement money from the advertisements opened in the search results. Although, SafeSearch Incognito add-on is not a virus, but it does bad things, and it introduces changes to some settings of all your typical web browsers. Moreover, an adware (also known as ‘ad-supported’ software) may be additionally installed on to your computer with this extension, which will open lots of advertisements, or even massive full page advertisements that blocks surfing the Net. Often such these advertisements can recommend to install other unknown and unwanted software or visit malicious pages. Therefore it is very important to clean your system of this plugin as quickly as possible. Follow the step by step guide below to get rid of SafeSearch Incognito extension, as well as other unwanted software and ‘ad supported’ software, which can be installed onto your PC along with it. There are a few ways that can be used to remove SafeSearch Incognito. But, not all potentially unwanted software such as this addon can be completely uninstalled using only manual methods. In many cases you’re not able to uninstall any plugin utilizing standard MS Windows options. In order to remove SafeSearch Incognito you need complete a few manual steps and run reliable removal tools. Most IT security researchers states that Zemana Anti-Malware, Malwarebytes or AdwCleaner utilities are a right choice. These free applications are able to detect and delete potentially unwanted programs like SafeSearch Incognito from your personal computer and revert back your web-browser settings to defaults. 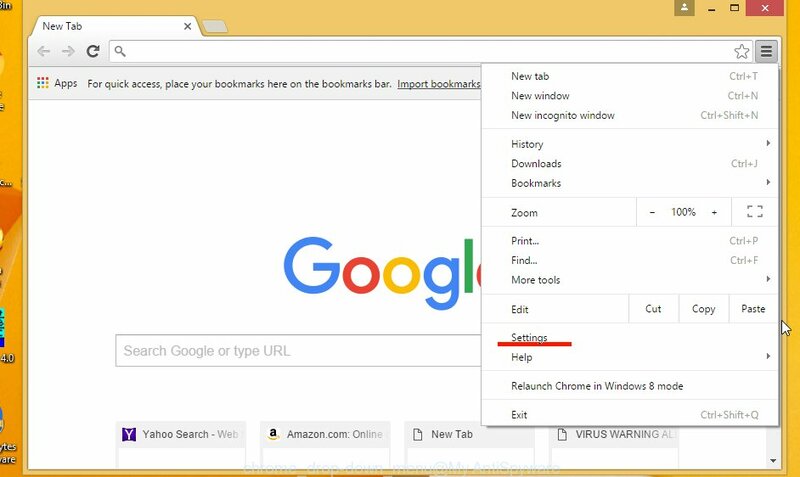 If you perform exactly the step-by-step guide below you should be able to delete the SafeSearch Incognito add-on from the Chrome, Internet Explorer, Firefox and Microsoft Edge browsers. 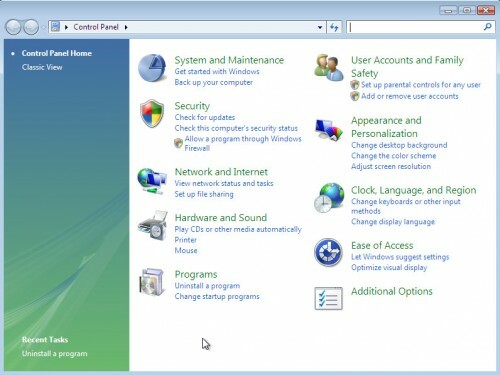 Some of potentially unwanted software, ad-supported software and addon can be deleted using the Add/Remove programs tool which may be found in the Windows Control Panel. So, if you’re running any version of MS Windows and you have noticed an unwanted program, then first try to get rid of it through Add/Remove programs. It will open a list of all software installed on your PC. Scroll through the all list, and delete any suspicious and unknown software. To quickly find the latest installed software, we recommend sort programs by date in the Control panel. If your Google Chrome browser is redirected to annoying SafeSearch Incognito page, it may be necessary to completely reset your web-browser program to its default settings. First launch the Chrome. Next, press the button in the form of three horizontal stripes ( ). It will display the main menu. Further, click the option named “Settings”. Another way to display the Chrome’s settings – type chrome://settings in the web-browser adress bar and press Enter. The internet browser will open the settings screen. Scroll down to the bottom of the page and click the “Show advanced settings” link. Now scroll down until the “Reset settings” section is visible, as displayed in the figure below and press the “Reset settings” button. The Chrome will open the confirmation prompt. You need to confirm your action, click the “Reset” button. The web-browser will launch the procedure of cleaning. 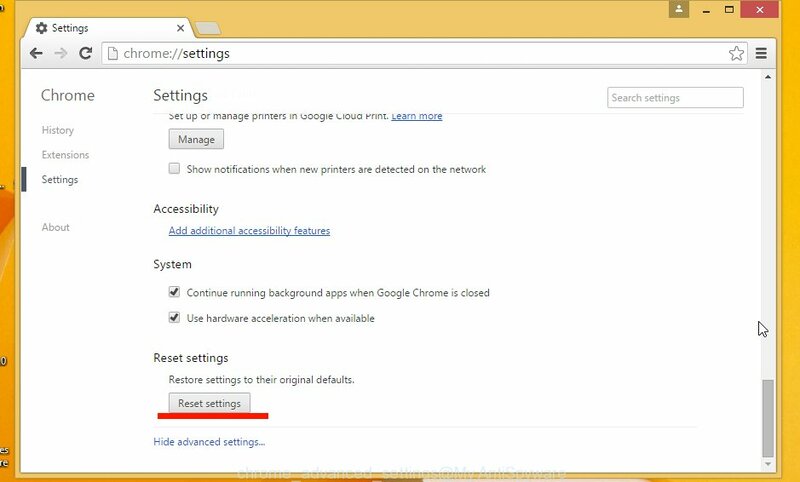 When it’s done, the web browser’s settings including startpage, new tab and default search provider back to the values that have been when the Google Chrome was first installed on your personal computer. Many antivirus companies have made programs that help detect and remove extension, and thereby restore installed internet browsers settings. Below is a a few of the free programs you may want to run. Your PC system can have lots of PUPs, ‘ad supported’ software and extensions installed at the same time, so we recommend, if any unwanted or harmful program returns after restarting the PC system, then start your PC system into Safe Mode and run the anti-malware tool again. We recommend using the Zemana Free which are completely clean your PC system of the extension. The utility is an advanced malware removal program made by (c) Zemana lab. 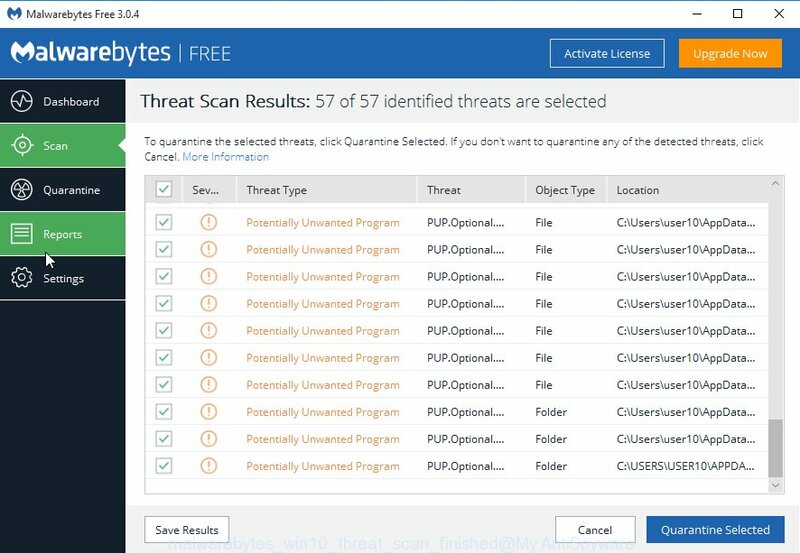 It’s able to help you remove potentially unwanted programs, add-ons, adware, malware, toolbars, ransomware and other security threats from your computer for free. 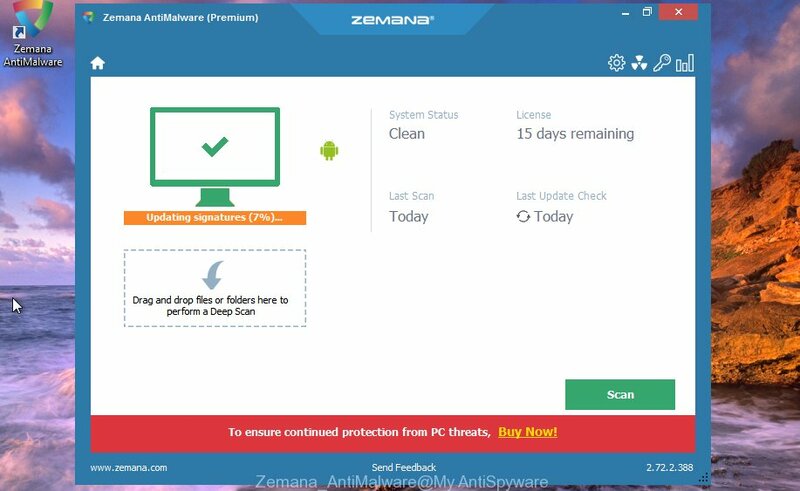 Click the following link to download Zemana Anti-Malware (ZAM) installer called Zemana.AntiMalware.Setup on your computer. Run the installer after it has been downloaded successfully and then follow the prompts to setup this utility on your PC system. When installation is done, this malicious software removal utility will automatically run and update itself. You will see its main window as on the image below. Now click the “Scan” button . 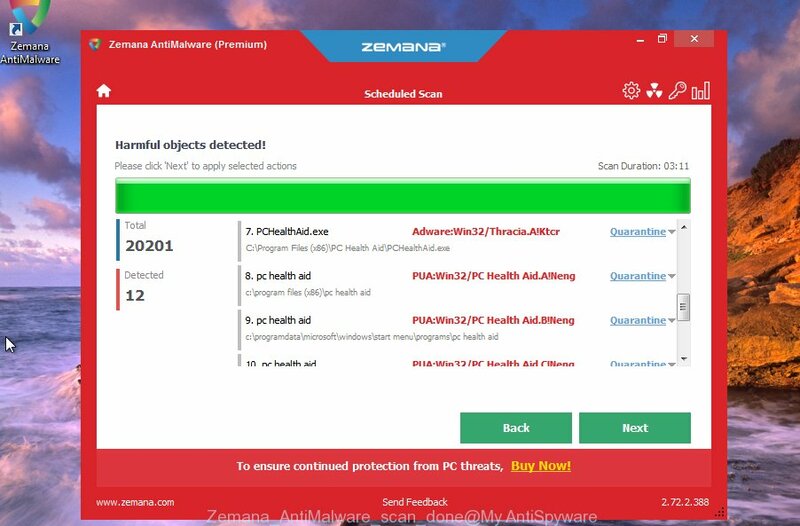 Zemana Anti Malware tool will begin scanning the whole computer to find out SafeSearch Incognito extension that changes browser settings to replace your startpage, newtab and search provider by default. A system scan can take anywhere from 5 to 30 minutes, depending on your system. 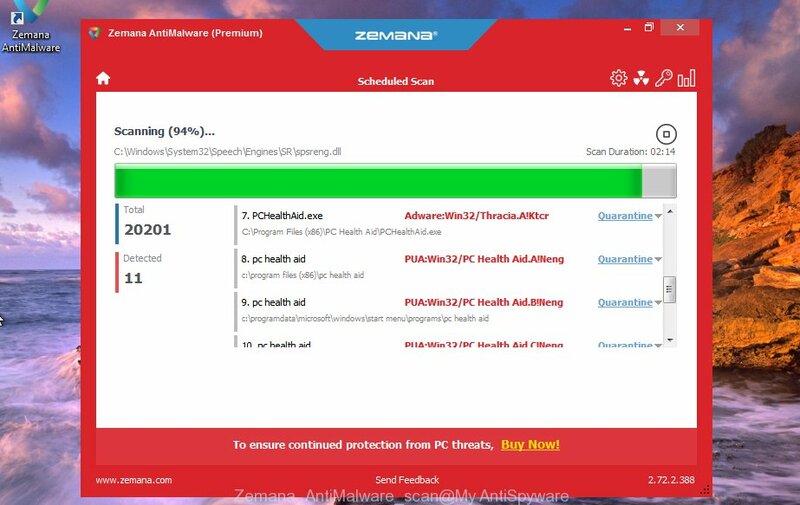 When the scan is finished, Zemana will show a scan report. Next, you need to click “Next” button. The Zemana Anti Malware (ZAM) will begin to get rid of SafeSearch Incognito add-on which redirects your web browser to undesired web sites. After the process is complete, you can be prompted to reboot your PC system to make the change take effect. 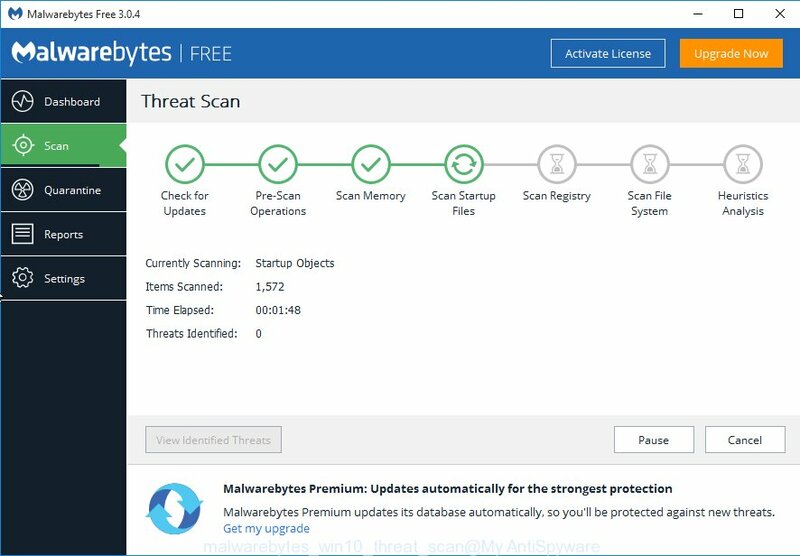 We recommend using the Malwarebytes Free which are completely clean your system of the plugin. The free utility is an advanced malicious software removal application designed by (c) Malwarebytes lab. 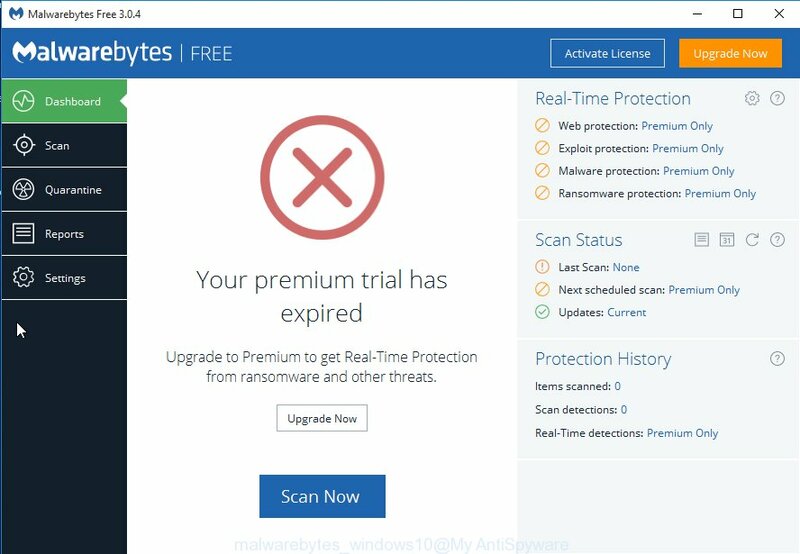 This program uses the world’s most popular anti-malware technology. It is able to help you remove extensions, potentially unwanted programs, malicious software, ad-supported software, toolbars, ransomware and other security threats from your personal computer for free. 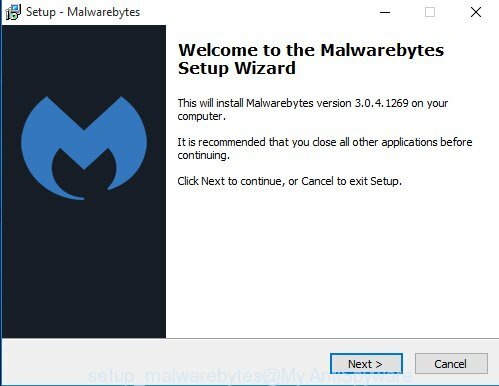 Download MalwareBytes from the following link. Save it on your Desktop. When the download is done, close all software and windows on your PC. Open a directory in which you saved it. Double-click on the icon that’s called mb3-setup as on the image below. Now click the “Scan Now” button for scanning your personal computer for the SafeSearch Incognito addon and other web-browser’s harmful add-ons. A system scan can take anywhere from 5 to 30 minutes, depending on your machine. When a malicious software, ad-supported software or potentially unwanted programs are found, the count of the security threats will change accordingly. Wait until the the checking is complete. Once that process is done, MalwareBytes Anti Malware (MBAM) will open a scan report. Review the report and then click “Quarantine Selected” button. The Malwarebytes will now remove SafeSearch Incognito extension that cause a reroute to an undesired web-site and add items to the Quarantine. When the task is done, you may be prompted to restart your personal computer. The following video explains step by step guide on how to remove hijacker, adware and other malware with MalwareBytes Free. 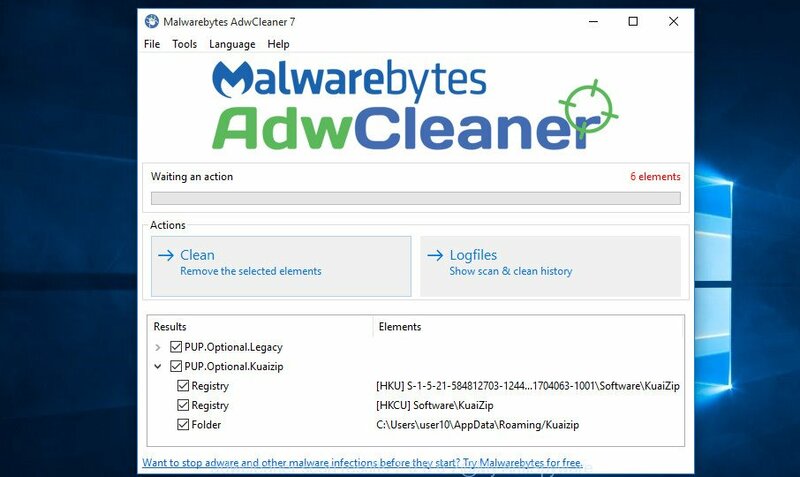 If MalwareBytes anti malware or Zemana Anti-Malware cannot remove this add-on, then we suggests to run the AdwCleaner. AdwCleaner is a free removal tool for malware, adware, potentially unwanted applications, toolbars as well as SafeSearch Incognito add-on and other kinds of potential threats like malicious software and adware. Double click the AdwCleaner desktop icon. After the utility is started, you will see a screen as shown in the following example. Further, press “Scan” button to perform a system scan for the SafeSearch Incognito extension that changes web-browser settings to replace your new tab page, start page and search engine by default. This process can take some time, so please be patient. After that process is done, AdwCleaner will open a screen that contains a list of malicious software that has been detected as shown in the following example. You need to press “OK”. Once that process is done, the AdwCleaner may ask you to reboot your PC system. When your PC is started, you will see an AdwCleaner log. If you surf the World Wide Web, you can’t avoid malicious advertising. But you can protect your web-browser against it. Download and run an adblocker application. AdGuard is an ad-blocking that can filter out lots of of the malvertising, blocking dynamic scripts from loading harmful content. Download AdGuard program by clicking on the link below and save it directly to your Windows Desktop. After the installation is finished, click “Skip” to close the installation program and use the default settings, or press “Get Started” to see an quick tutorial which will assist you get to know AdGuard better. In most cases, the default settings are enough and you do not need to change anything. 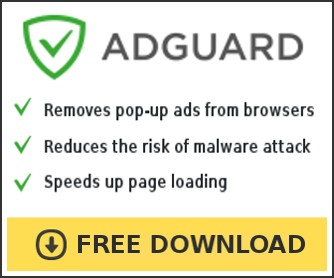 Each time, when you start your PC system, AdGuard will launch automatically and stop popup ads, browser redirects, as well as other malicious or misleading pages. For an overview of all the features of the program, or to change its settings you can simply double-click on the icon named AdGuard, which can be found on your desktop. Many extensions such as SafeSearch Incognito are included in the free applications installation package. Most commonly, a user have a chance to disable all included “offers”, but some installers are developed to confuse the average users, in order to trick them into installing an adware or PUPs. Anyway, easier to prevent the extension rather than clean up your PC system after one. So, keep the web-browser updated (turn on automatic updates), run a good antivirus software, double check a free programs before you start it (do a google search, scan a downloaded file with VirusTotal), avoid harmful and unknown web-sites. After completing the step by step guidance above, your machine should be clean from the SafeSearch Incognito extension and other unwanted software. The Chrome, FF, MS Edge and Microsoft Internet Explorer will no longer open an unknown page on startup. Unfortunately, if the tutorial does not help you, then you have caught a new addon, and then the best way – ask for help. Please start a new thread by using the “New Topic” button in the Spyware Removal forum. When posting your HJT log, try to give us some details about your problems, so we can try to help you more accurately. Wait for one of our trained “Security Team” or Site Administrator to provide you with knowledgeable assistance tailored to your problem with the intrusive SafeSearch Incognito addon.